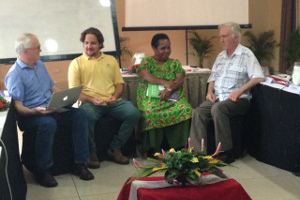 We held our third Master Class in Communicating Research to Stakeholders in Nadi, Fiji from 25-31 May 2014 for approximately 20 agricultural scientists and communicators from across the Pacific – (read our earlier story here). This followed the first Master Class in Chiang Mai, Thailand for researchers from around Asia, and in 2013 in Addis Ababa, Ethiopia for African researchers which have all been reported previously. The purpose of the training is to help agricultural scientists to tell the story of their work and its impact to a broad range of non-scientific audiences in funding agencies, other interested stakeholders such as farmers and extension agencies and to the general public through the media. We have released a short video of some of the participants from the training in Fiji talking about the benefit of the Master Class (below). It can also be viewed on the Crawford Fund YouTube Channel. Three months after the conclusion of the Master Class, participants are putting their new knowledge into practice. Further Master Classes are planned for 2015 – for details contact Cathy Reade who manages the training with facilitators Jenni Metcalfe from Econnect Communications and Toss Gascoigne from Toss Gascoigne and Associates.